Willow weed is a plant species that is variable in appearance and may be both native and introduced. 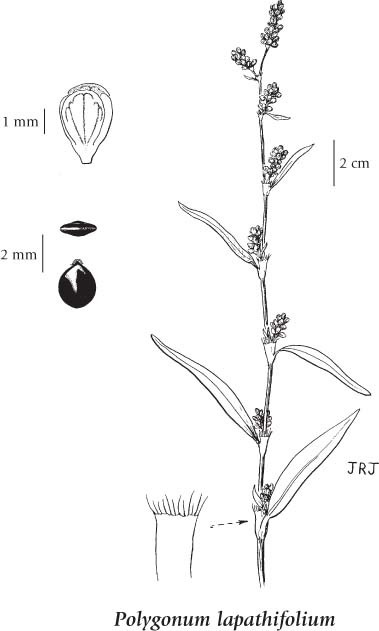 "Persicaria lapathifolia is a morphologically variable complex with more than two-dozen infraspecific taxa described in the New World and Old World." (Hinst and Freeman 2012). Annual herb from a taproot; stems erect (occasionally prostrate), solitary, usually freely branched, 20-80 cm tall/long. Basal leaves lacking; stem leaves alternate, lanceolate or oblong-lanceolate, smooth or more often hairy or glandular below, the blades 5-20 cm long, the stalks short; stipules 5-20 mm long, brownish, more or less smooth, fringed with bristly hairs at the top. Inflorescence a loose, often drooping panicle of spikelike racemes, 1-6 cm long; perianths greenish-white to pink, distinctly veined, the veins branching and turned back at the tip, about 2.5 mm long, 4- to 5-lobed nearly to the base. Achenes, usually lens-shaped, egg-shaped to nearly rounded, dark brown, smooth and shiny, 2-3 mm long. Moist meadows and wet shorelines and swamps in the lowland, steppe and montane zones; common in SW BC, infrequent in SC BC, rare in SE and NE BC; introduced from Europe.